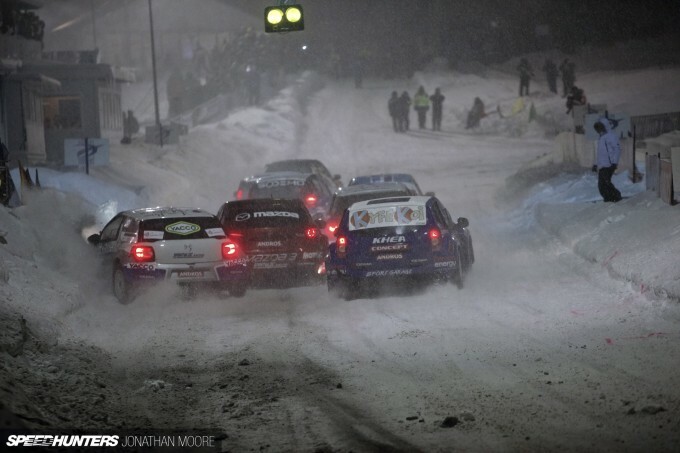 To get the full sensory overload of the Trophée Andros ice racing series in France, you need to get up close. 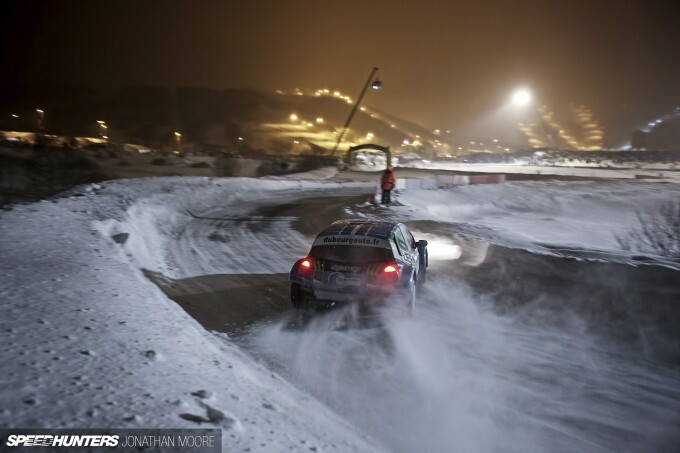 You have to get knee-deep into the snow banks that line the track to get a sense of just how claustrophobic it is for the drivers, scrabbling through the whitewall trenches below. Walk on the track surface – which will lead to slips at best and more likely a fall – and you quickly understand how insane it all is. 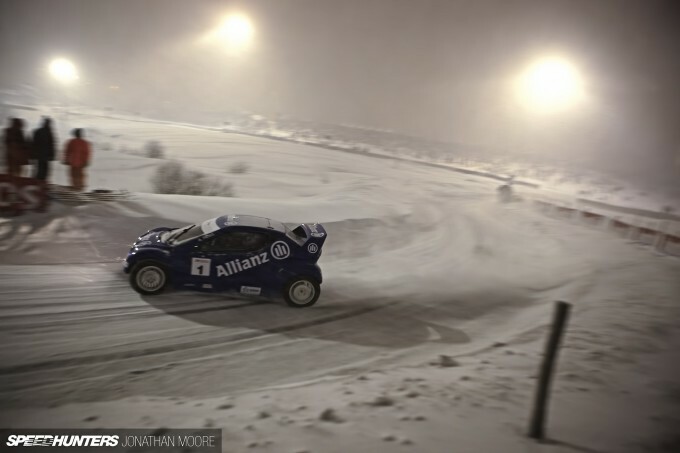 You have to see the drivers’ eyes out on stalks, as their arms saw away at the wheel and the cars below them struggle to find traction. Talk to a driver, and their grins tell you another story still: there are few series that deliver as much outright driving joy. 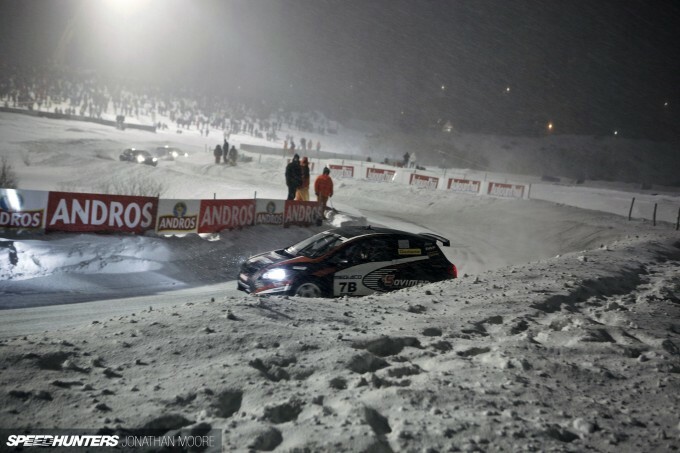 As I mentioned in the introductory story, the Trophée Andros came about in 1990 when French rallycross star Max Mamers and Frédéric Gervoson, head of the Andros company, got together for a winter of mucking about in cars on the snow – but ice racing was nothing new in France. 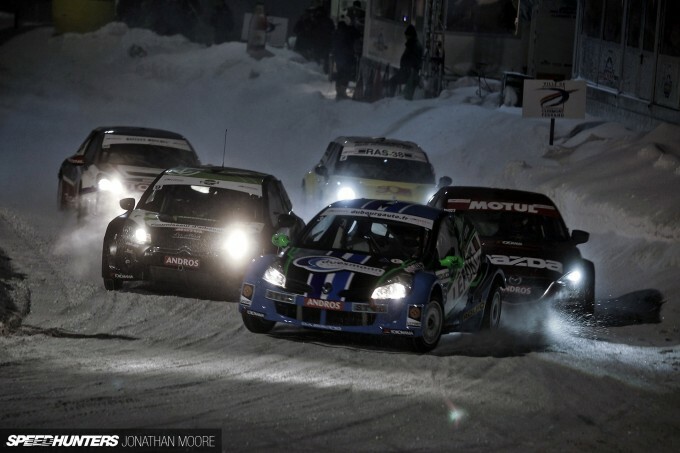 There had been ice racing held over 24 hours at Chamonix in the Alps starting in 1970, with famous drivers like Jean Ragnotti, Henri Pescarolo, Markku Alén and Stéphane Peterhansel taking part. 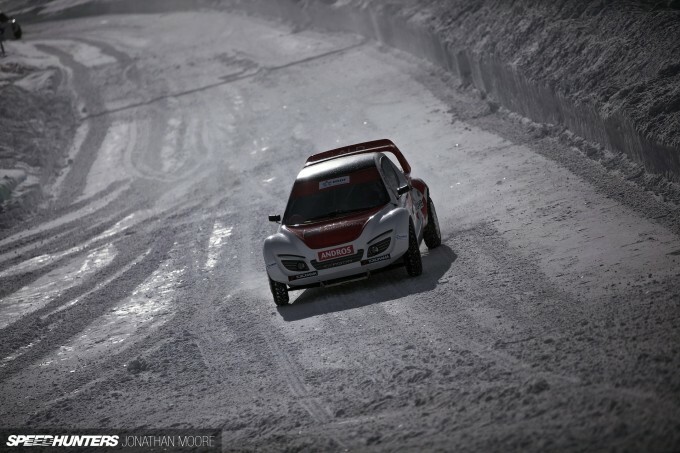 There are some incredible images of Group B quattros getting harried by little Fiat Pandas! 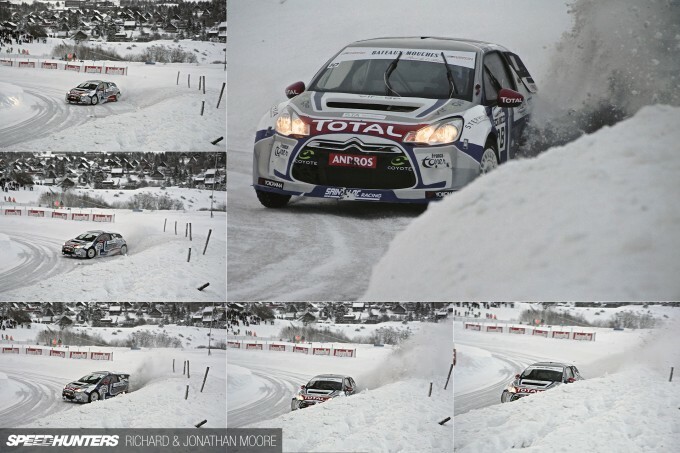 The cars in the Trophée Andros have varied hugely over the years. 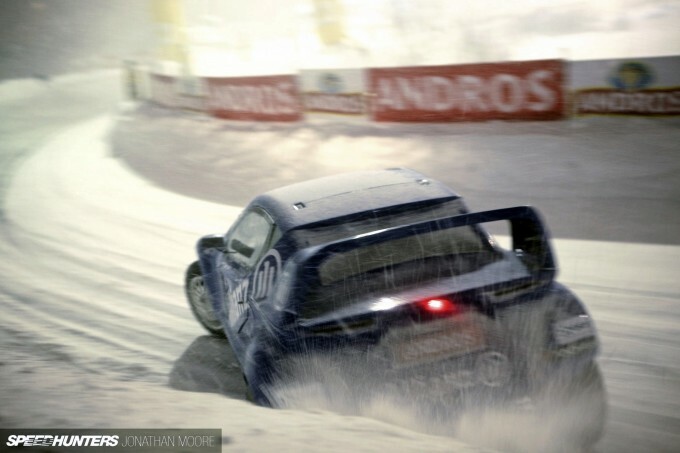 Back in the ’90s at the birth of Andros you saw machinery like veteran Group B Peugeot 205 T16s, followed by BMW M3s, Porsche 924s and big old things like Merc 190s slithering round, barely modified GTs and saloons; but soon custom-built racers took over. Now the cars are bespoke silhouettes based around cutting-edge spaceframe chassis, taking compact hatches as the base models. 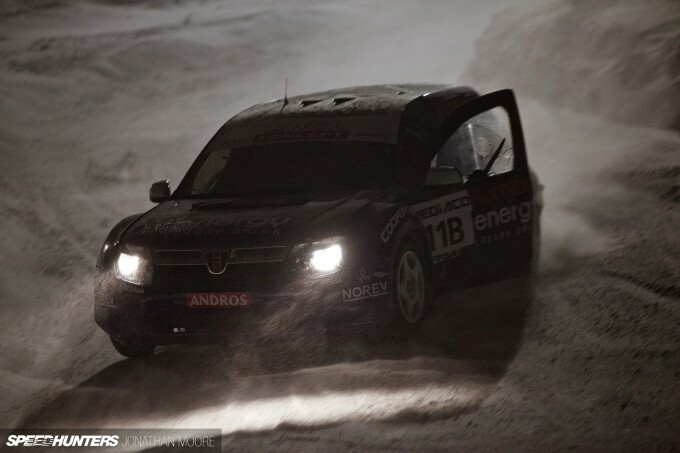 This year there’s one each of Dacia’s boxy Lodgy and Duster; a brace of MINI Countryman and new Mazda 3s; trios of Renault Clios and Citroën DS3s; plus a singleton Toyota Auris entered by WRT. 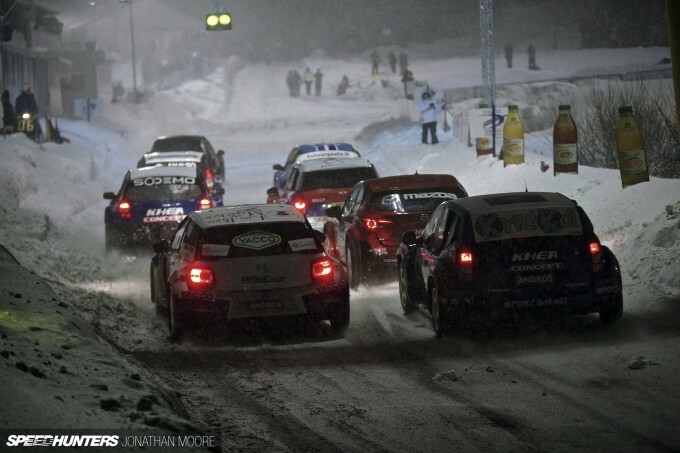 13 cars with 26 drivers spread across two icy tiers. 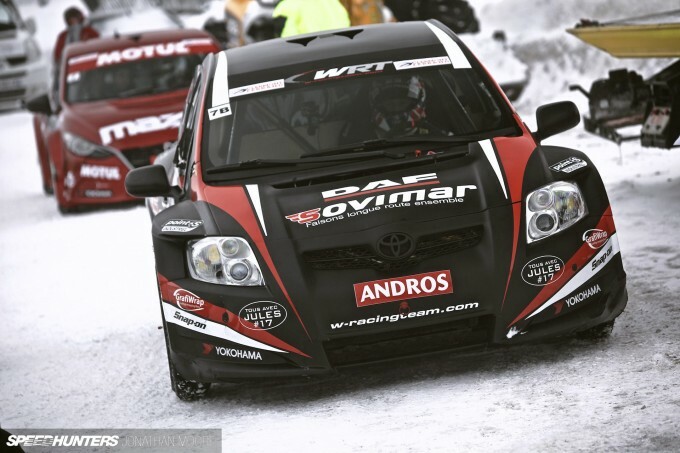 For Super Besse, I took the opportunity to catch up with our friends at the WRT team, who have been campaigning an older Auris for this, their debut season in Andros. 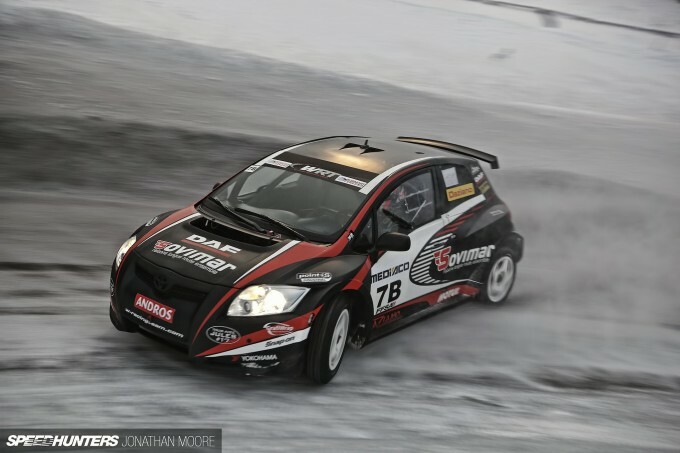 It’s a model that took the championship in both 2007 and ’08, and the WRT chassis actually dates back to that period, though completely rebuilt and sprinkled with some WRT magic. 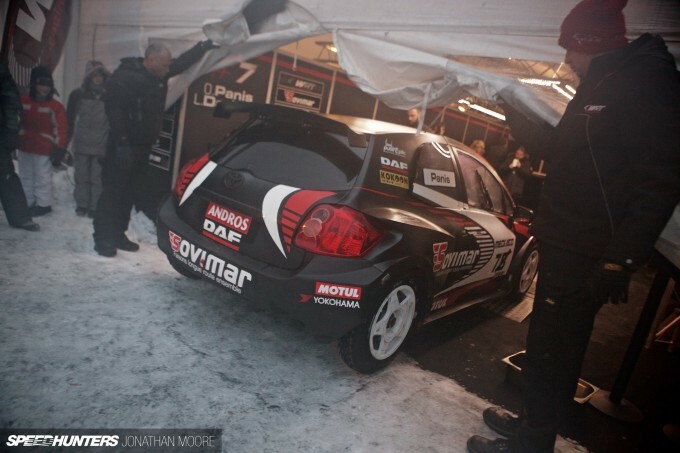 If you’ve followed Speedhunters for a while, you’ll likely recognise the WRT name. The Belgian team exploded on the GT scene only a couple of years back, and campaigned Speedhunters-liveried Audi R8 LMS GT3s in races like the Nürburgring and Spa 24 Hours. 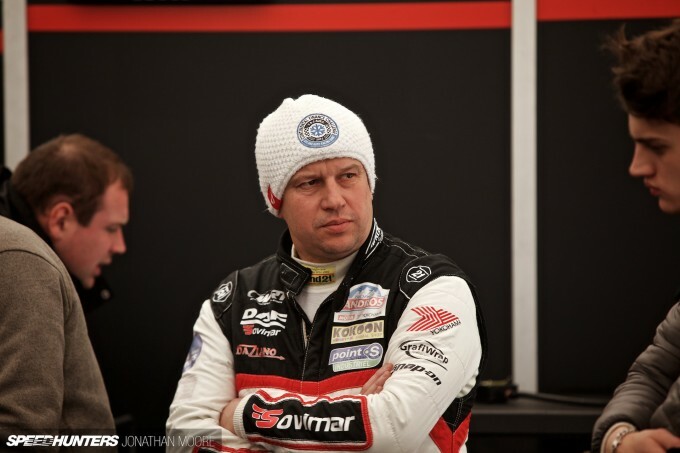 They’ve won a hat-full of races and overall championships, in both the Blancpain and French national GT series. Having an old car isn’t such a hinderance, as there’s only been one step change upgrade for homologation, back in 2011, and development is in any case relatively free outside the approved body and chassis. 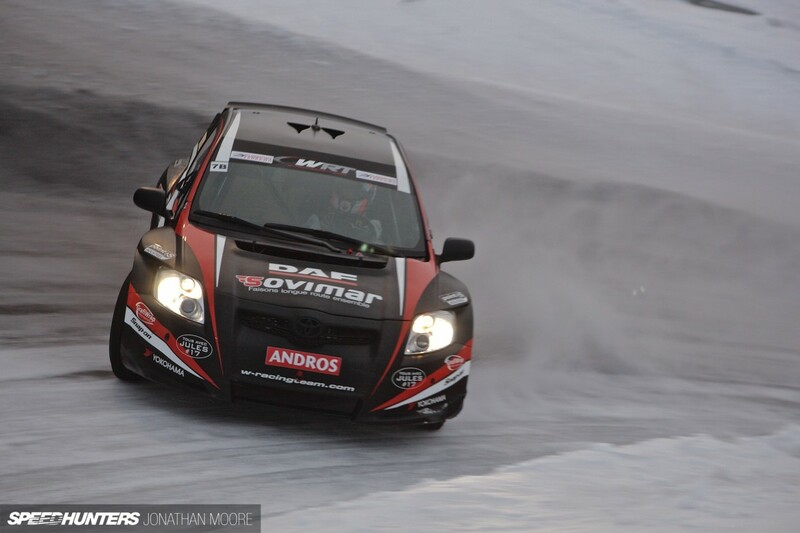 That’s given the WRT boys even more scope to demonstrate their skills. The team’s big coup came with the signing of ex-Formula 1 driver Olivier Panis – the last French driver to win an F1 race. 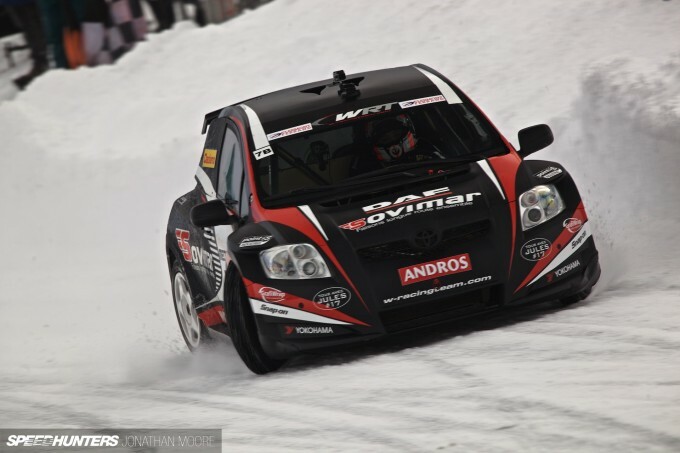 He’d actually already competed in Andros for seven years, driving for various teams and wracking up a decent haul of half a dozen wins, but the partnership with WRT has been particularly effective. It’s great to see an F1 and Le Mans driver that bit more relaxed in such a relatively low-key setting, enjoying the freedom and openness of the Andros paddock. His son Aurélien also now runs in the series, driving one of the Exagon electric prototypes. 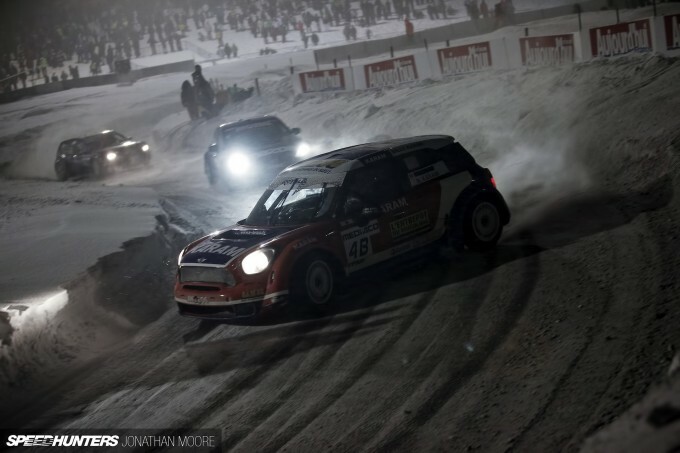 Why didn’t my dad take me ice racing in the winter, I ask myself… Another son of an F1 driver (and current DTM pilot), Adrien Tambay, also competes in that category. 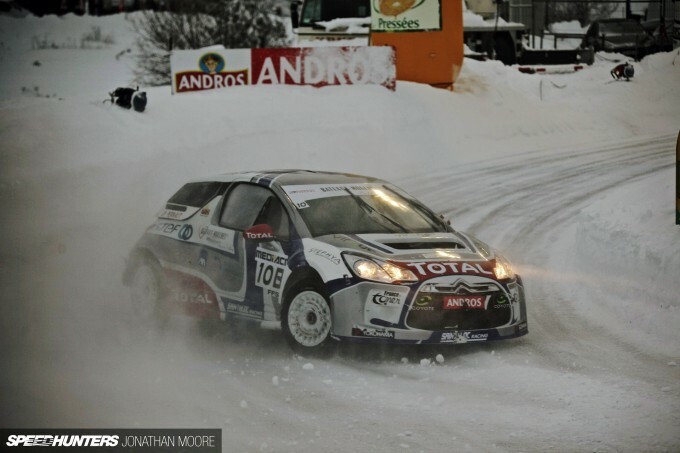 Sharing the Auris with Olivier is a second driver, Lionel Daziano, who runs in the second-tier Elite 2 division. This car-sharing plan reduces costs, but of course puts massive pressure on the mechanics. 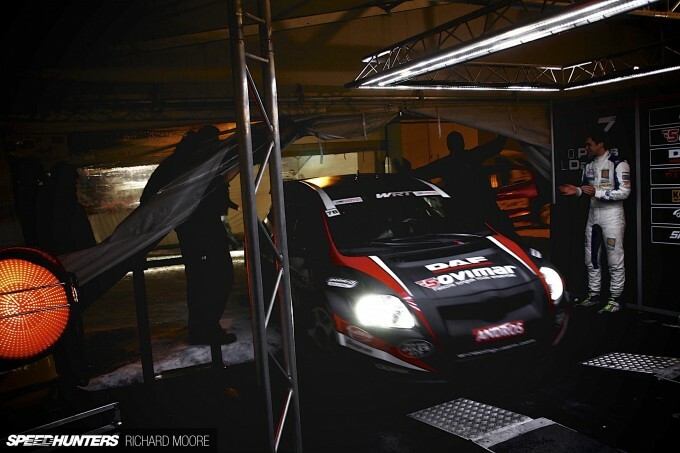 The Elite 2 cars always go out first, so if something goes wrong there’s minimal time to do anything but running repairs – 15 minutes maybe. And there’s plenty that can go wrong, as we’d find out. 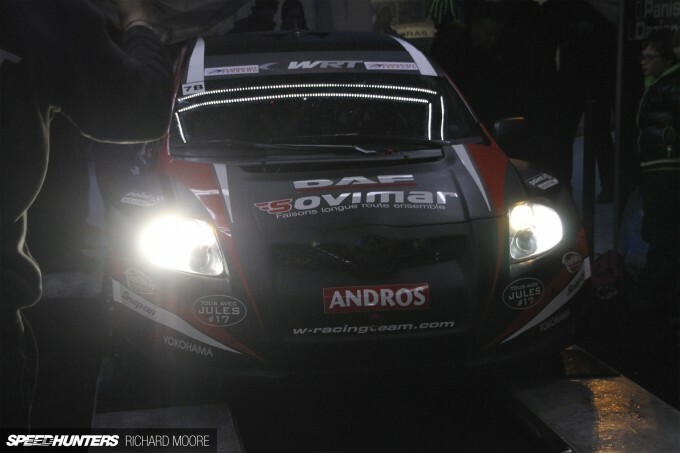 The surprise is that just four mechanics supported the two WRT drivers, overseeing every aspect of the team at the track: trucking all the gear on site and setting up the operation, wrenching on the car, digesting data, setup, tyres – everything. It’s a hell of a lot of work for such a small crew. Both WRT drivers had enjoyed a stunning season in their shared Toyota – Lionel was heading the Elite 2 group and Olivier second in Elite going into this final round. That car in the background was the problem they’d have to deal with. 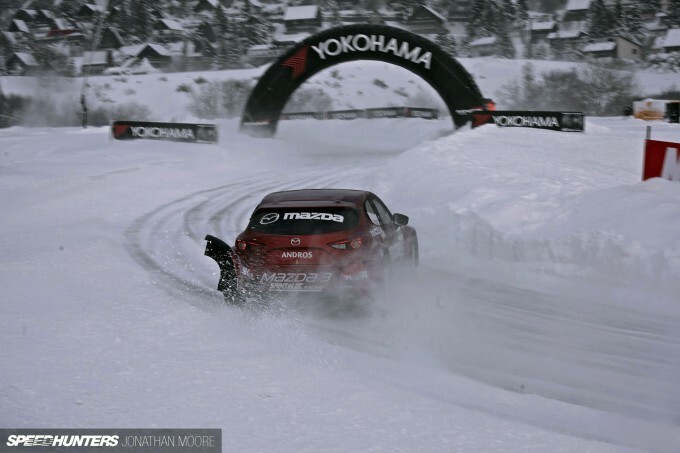 Within touching distance of WRT and Panis all season had been the leading Mazda of Andros veteran Jean-Phillipe Dayraut, a five-time champion and Elite in every sense. 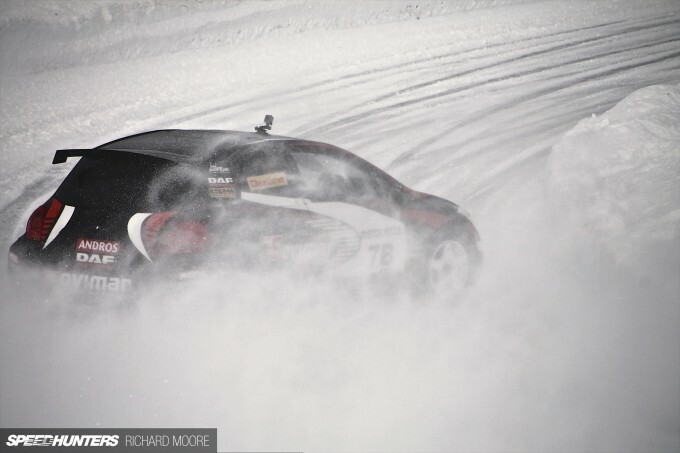 It does seem that when teams and drivers click with ice racing, they can take it to another level – which has made WRT’s debut season performance look even more impressive. 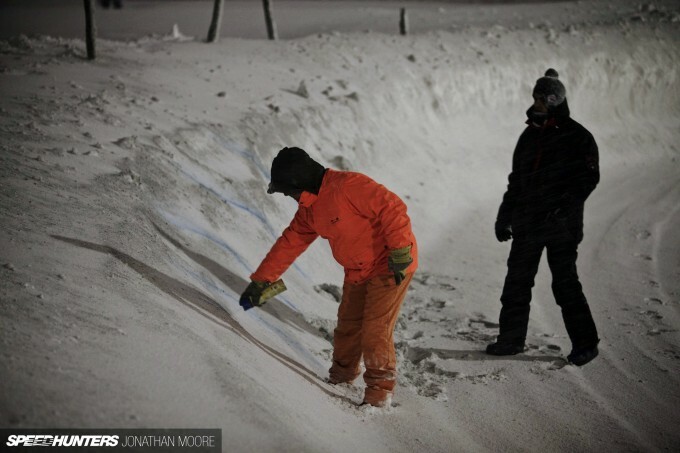 A key part of every Andros weekend is the track walk. The circuits might be short, varying between just 600 metres and a kilometre, but the width makes a big difference – as, more importantly, do the conditions. With the track somehow dug out of the field of snow and the driver briefing complete, all the drivers headed out to saunter round the track and soak up the unexpected and welcome appearance of a bit of sunshine. Whilst Pierre, WRT’s lead engineer for Andros, kicked and prodded his way around, Olivier and Lionel talked driving styles and tactics. Super Besse was pretty flat and open compared to other tracks, some of which have more banked corners or weave through the forest. 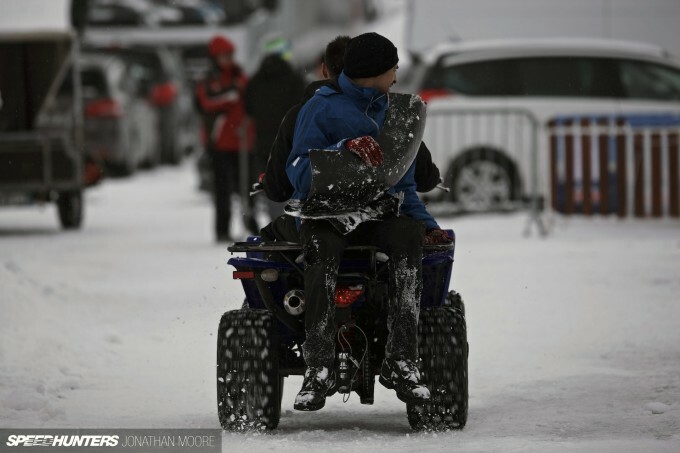 Walk completed, the knowledge they’d gained could be transferred directly onto the car: diff preloads, rear-steer ratio, shocks, ride heights – and then those frozen chainsaws of tyres. 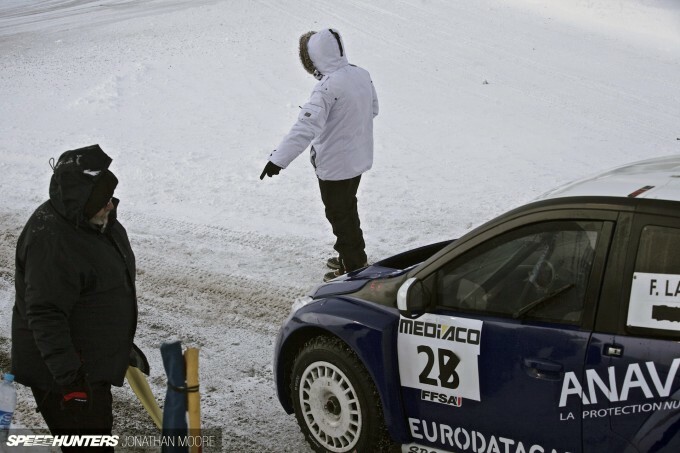 The rubber is absolutely critical, and with just six control tyres available for the whole event there’s no room for error. It’s all about getting pressures correct for the ice, setting up all the tungsten studs so they create maximum traction at all times. 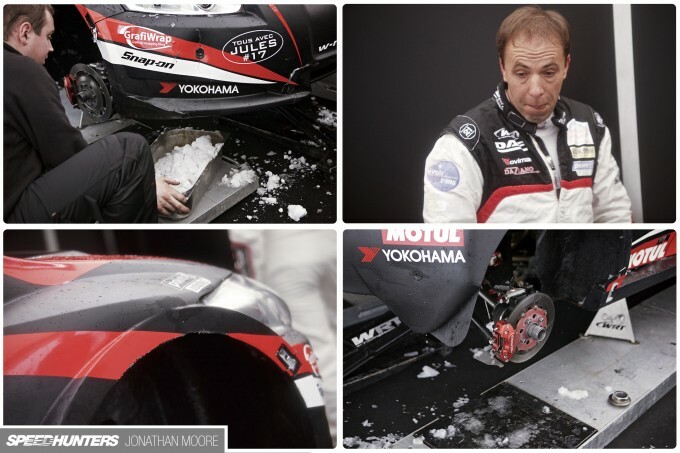 Luckily here they wouldn’t have what frequently happens, with tarmac exposed as the ice is cut into, ripping the tyres to pieces. 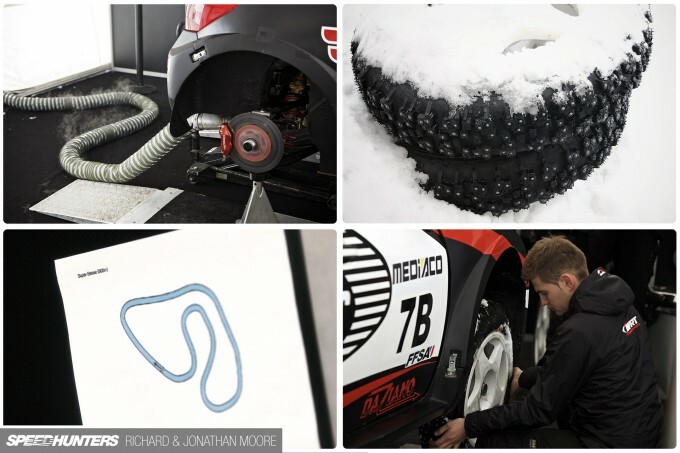 Wheels are left out in the cold to keep in track with the freezing ambient temperatures: literally in the snow piles outside the team’s awnings. Inside the tents, big heaters blew hot air around, creating a tolerable working environment for the mechanics, but one that would completely skew the setup of those delicate fusions of rubber and tungsten. The two quartets of timed laps would be providing the majority of points for the weekend for each driver. Just two sets of practice runs preceded those crucial sessions. 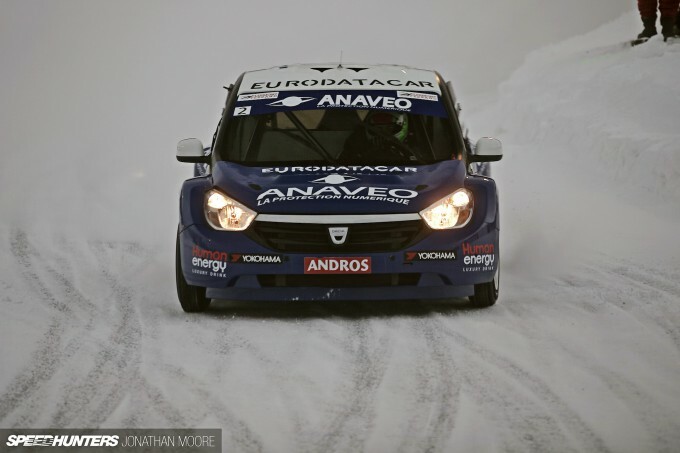 Panis and Dayraut might have been in the Elite pound seats, but Dacia’s Franck Lagorce, another driver with F1 starts to his name, wasn’t far behind – in points or times. 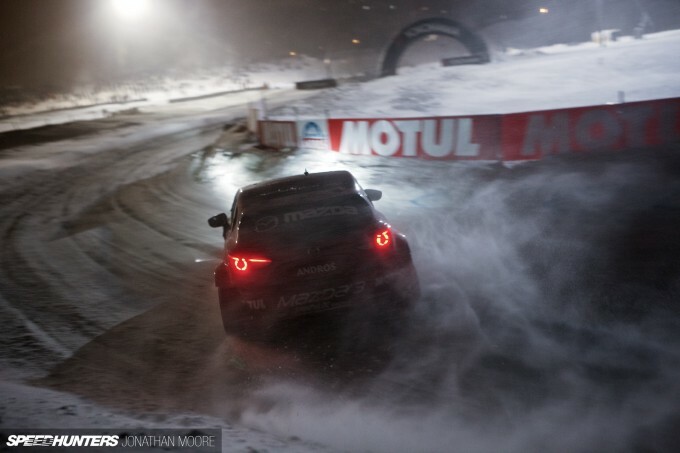 The first warm-up laps were visibly more tentative, drivers building up confidence in lines and turn-in points as they were let loose in groups to carve through the snow. Moving into second practice, things quickly got far more brutal, the cars subjected to total commitment with no let up. The surface would change not just from lap to lap but corner to corner, rut to rut. Still, lap times were only separated by tenths of a second, drivers generally showing incredible consistency. 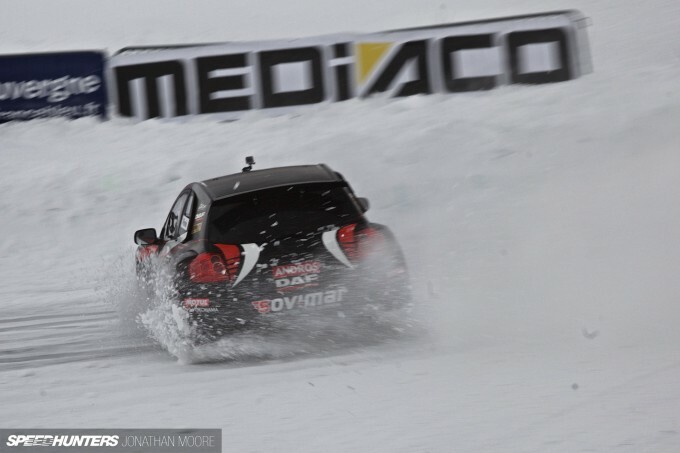 Visibility on-track was minimal. 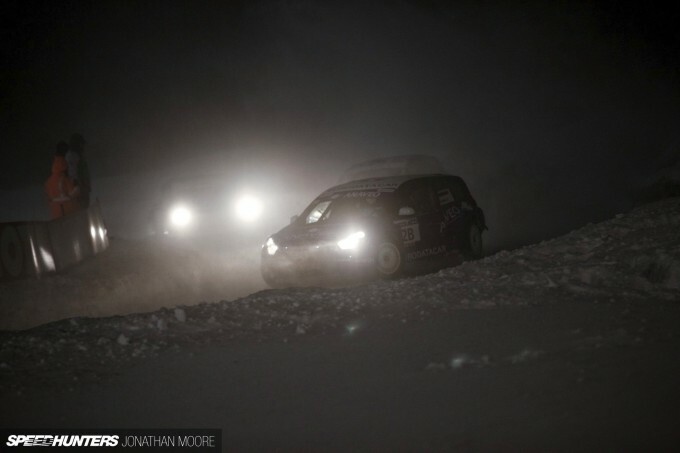 The drivers are low down in the cars, and threading the needle between high banks of snow in the midst of a lunar landscape. Threading an insanely slippery needle at that. 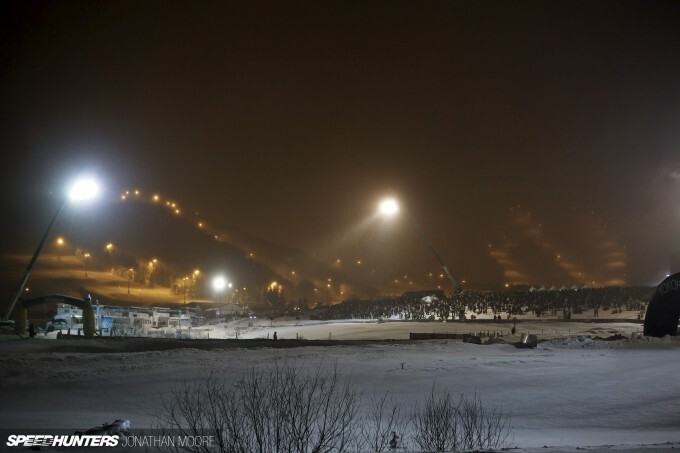 All they see is a twisting, claustrophobic tunnel of white during the day, and then at night less still, with dark ahead but with floodlights also pulsing down from above. 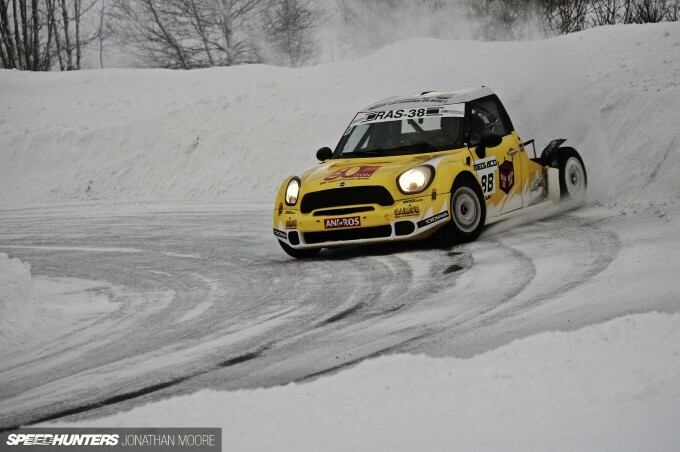 Travelling sideways as much as forwards, every car’s side windows mounted mini wipers which would be flapping away madly to clear snow, and the driver’s headrests were far more open than a regular race seat, allowing them decent lateral vision. But it was no wonder that between sessions the freezing marshals would run down onto the track and spray direction arrows around the corners. The banks claimed a succession of victims. 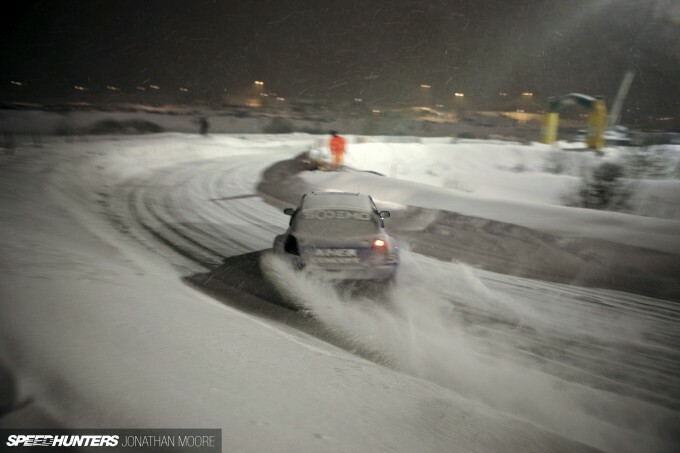 Tactics are completely different to a snow rally, where in more solidly-built WRC cars you might use soft snow banks to help you round corners. Here the banks were solid cliffs of dense snow and ice, hard frozen into shape. 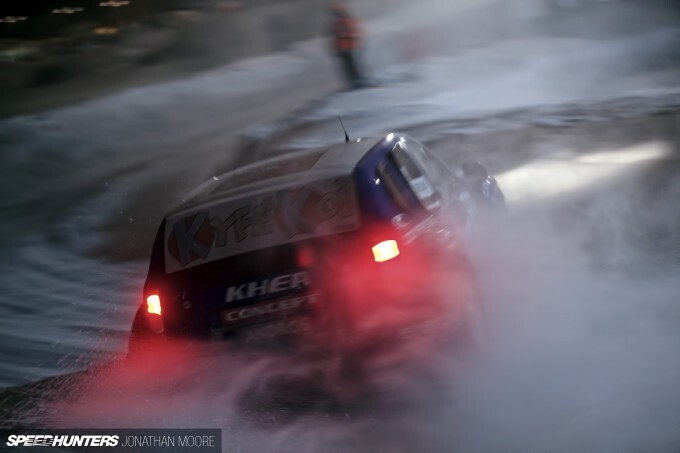 Drift out wide – as would inevitably happen at one corner or another when at maximum attack – and it would be a case of limiting damage as much as possible through delicate throttle control and that four-wheel steer. That’s an easier thing to say than do, and it’s surprisingly hard stuff, snow. 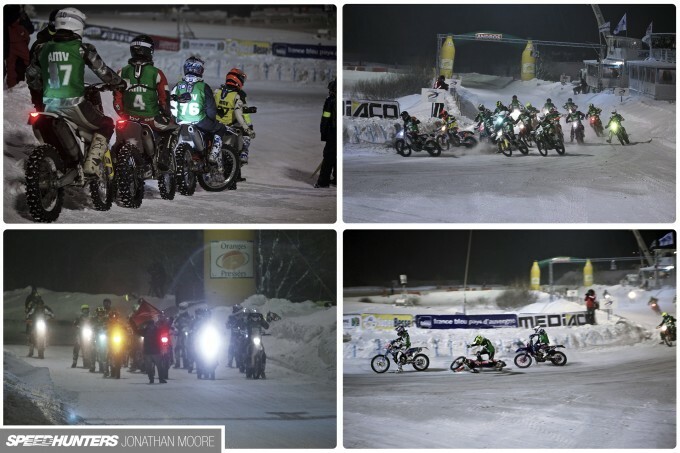 There was one particular section around the back of the track, between the second and third right-handers, where a tighter-than-you’d-think right kink seemed to provide a particular challenge all through the day and night. 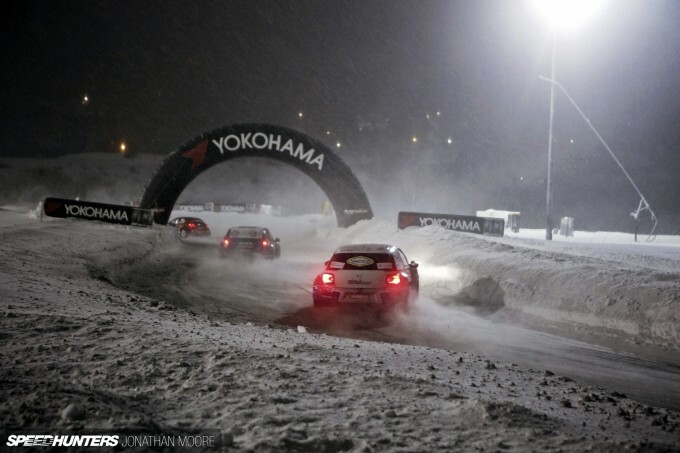 Too slight to be a real corner, too much of an angle to go through flat, car after car inexorably drifted out wide to throw up fountains of snow as they grazed the outside bank. Hit it obliquely, and you could just about get away with it, but any kind of angle and it would mean saying goodbye to a considerable chunk of fragile bodywork. The following hairpin had more space around the outside and a gentler gradient, which was perhaps more forgiving, though that didn’t make it any less spectacular when cars understeered out wide. First they’d make contact with the rear, which would then bring the front round to also smack into the snow – at the same time covering anyone on the outside of the corner in a spray of snow and dirt. An increasing amount of smashed bodywork began to accumulate around the track, salvaged by marshals whenever possible and heaved off to one side. 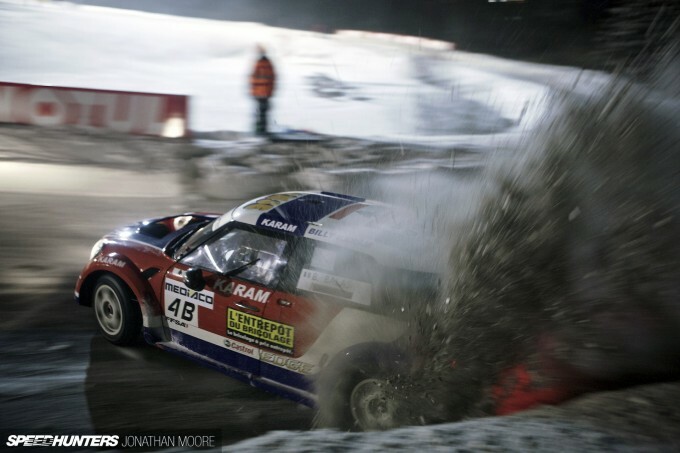 However, there’s a difference between a corner being torn off and the entire back of the car. One of the MINIs turned into a drift truck after ripping off the complete rear deck in the above incident. But you can’t stop. With just those two runs of four laps that bring home the points, you just had to keep your foot in, and worry about the look on your mechanics’ faces later. 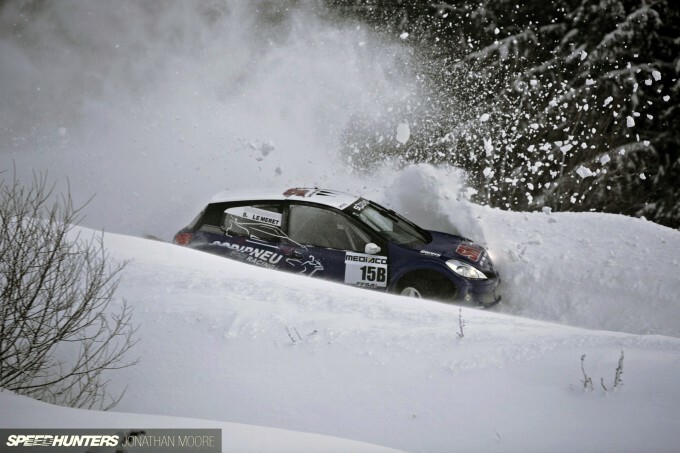 Mistakes for one car would accumulate rapidly into affecting the other cars also blasting round in that session. 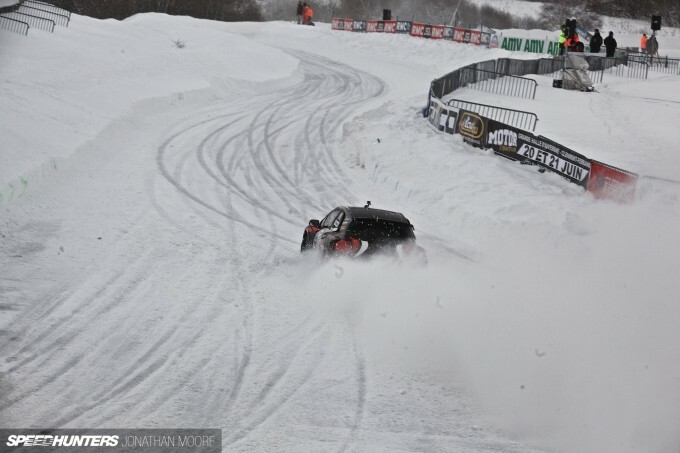 One of the DS3s spun out wildly at the last corner, ending up facing the wrong way. Within seconds the demo-MINI had arrived on the scene, having just kept on it despite the aesthetic damage. He slammed on the anchors and slithered to a stop. Another moment later, and the third car out also piled into the action – with nowhere to go. He slid out wide, smacking into the snow bank but thankfully avoiding the two stationary cars. It was one of those moments where you see it all unfolding as if in slow motion, hold your breath and hope that everyone makes it through to the other side… The rear deck of the MINI was subsequently thrown on the back of a truck and returned to its embarrassed owner, whilst yet more fenders, splitters, mirrors and general debris was added to the marshal post stashes. 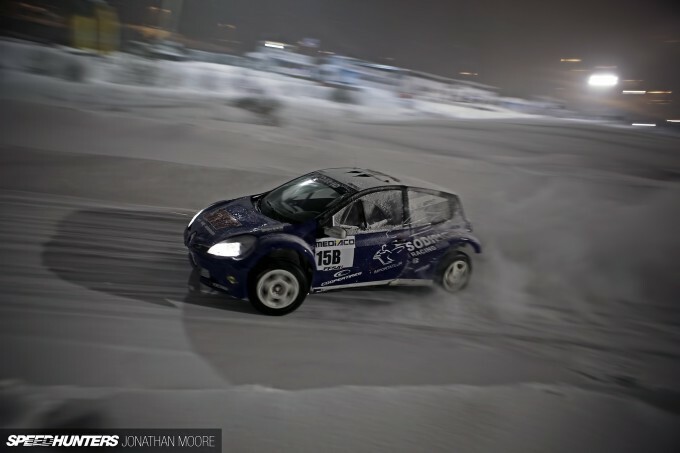 Sometimes drivers managed to just about hold onto their cars as they fell apart around them, like Guillaume Maillard in his Dacia Duster, who had to cope with his door swinging open during his runs. 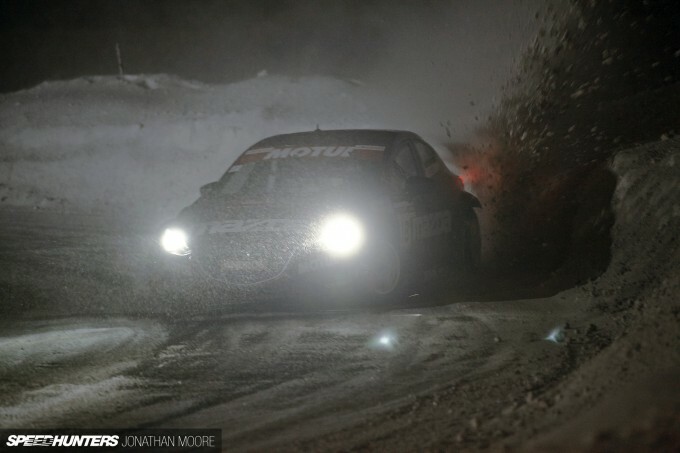 Again, no time to worry about it… Maybe it actually helped with visibility?! Eventually the larger parts would be picked up by teams and ferried back to base for a game of Kevlar ‘match the piece with the hole in the car’. 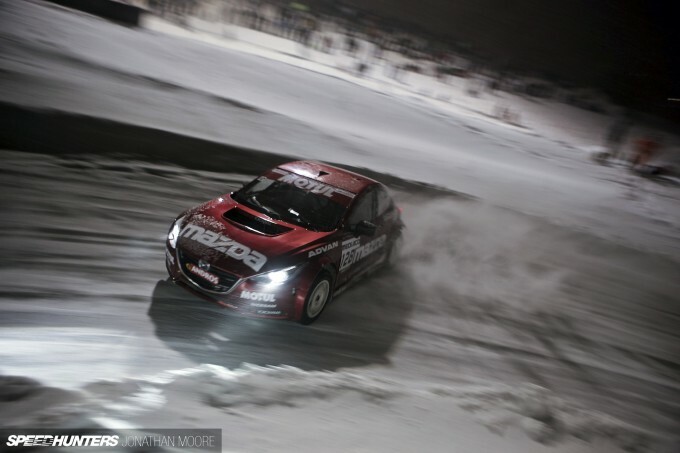 The action out of track was constant from about two in the afternoon – and would go on until well past 11:00pm at night. This was great for the fans who crammed into the bank overlooking the track and reward for their hardiness. 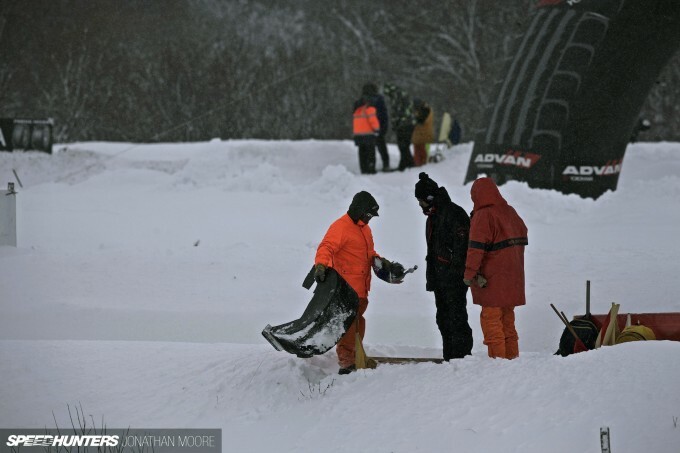 With no let up, the Elites, female buggy drivers, electric cars and those unhinged bike riders hammered round Super Besse’s ever-changing track. 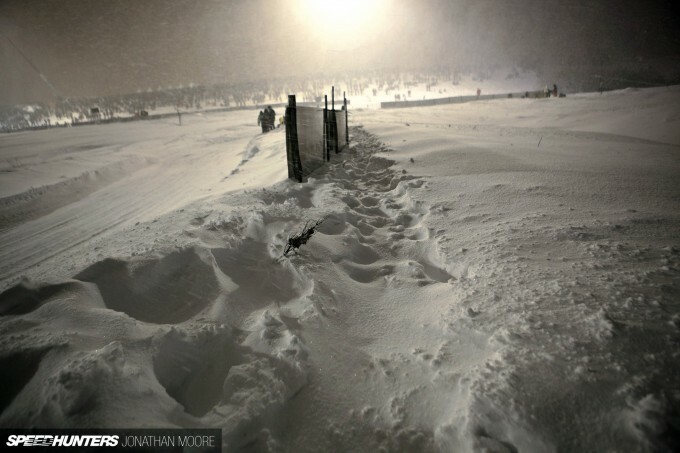 It was as much a journey into the unknown for the snappers and cameramen around the track, though as the night drew in fewer and fewer photographers were brave (stupid?) enough to venture out. After the first footsteps were sunk into a bank, more would follow, going Tuscan Raider style in the same traces to see where the snow was soft and where was solid. Eventually small trenches would be carved out in the popular areas that could be traced with less chance of falling over or sinking to your knees in a drift. Less well travelled areas, like the hairpin, might have individual foot-holes to follow, often covered in again after each fresh dump of snow. Each time I found a decent spot, after inevitably sinking down a foot or so into the snow, I’d stamp out a solid firing pit to stand in, forming a more secure platform. 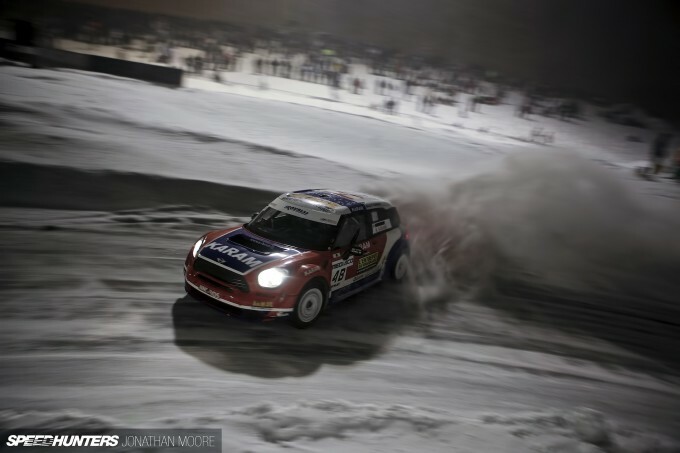 Drivers runs could be judged from the varying pitch of the French commentator’s voice over the PA and the roar of the crowd in response, echoing across to the far reaches of the track that I was struggling through. 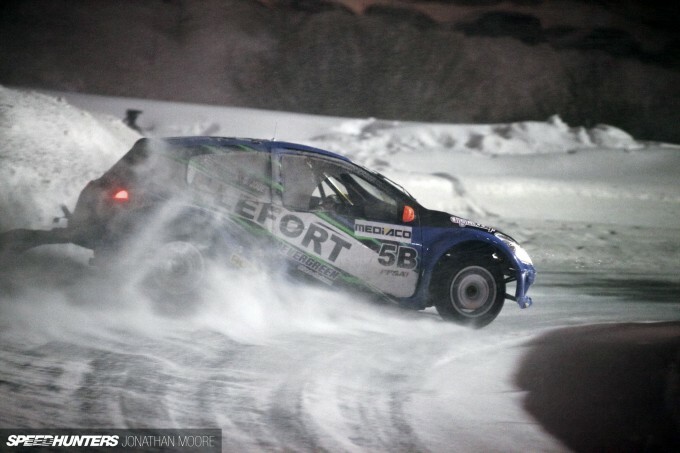 Cars were sent out in batches using championship order, which meant that the each session deliberately ended with a two car battle: the top two in each class, head to head on-track against each other, the ice and the clock. Lionel would be up against Sylvain Pussier’s DS3 in Elite 2. Bang! Over a second faster with his fastest laps in the first session; a massive three seconds in the second, with laps barely a couple of tenths apart each time. Maximum points, 45 in the bag, guaranteeing he’d take the Elite 2 title whatever happened in the all-in finals later that evening. 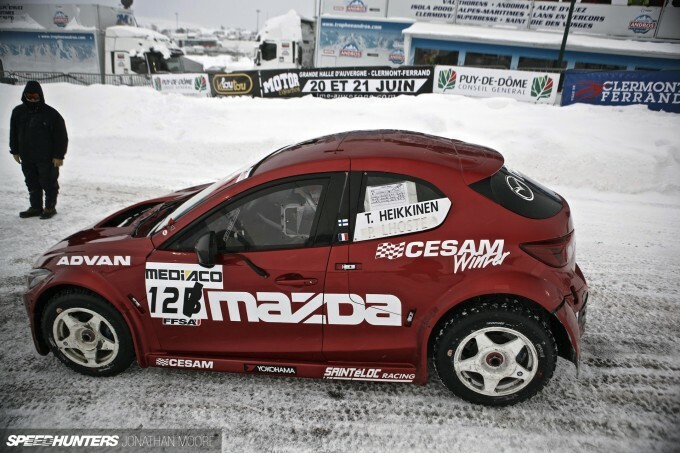 Olivier Panis would always be followed out by arch rival Jean Philippe Dayraut’s Mazda 3. Olivier did all he could: posting the fastest combined times in both sessions and also picking up the maximum score – but although the Mazda was only third and fifth it was enough to keep Dayraut ahead by six points. With the timed sessions over, they’d be an hour wait for the Elite 2 finals, and two until the Elite showdown. 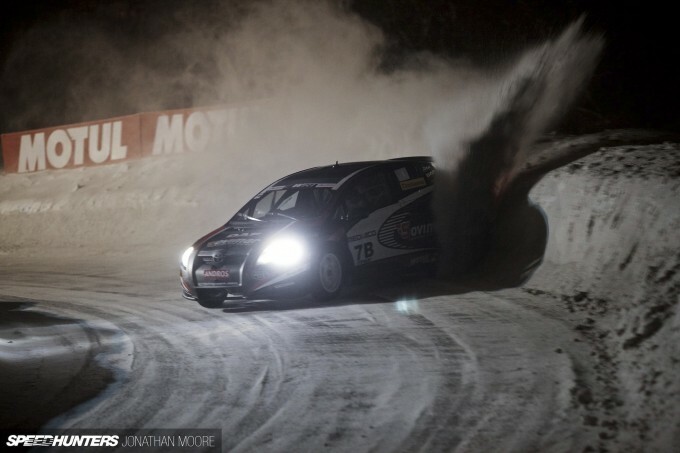 The tension in the WRT camp was unbearable as the finals drew near… 15 points for a win would push Panis ahead, but Dayraut would only have to make up a single position to retain the crown. Light relief, for me at least, was provided by the AMV Cup riders race. One by one was crazy enough, but a whole swarming pack of bikers provided total chaos and awesome entertainment. The front-runners were stunning riders: a level above the others. 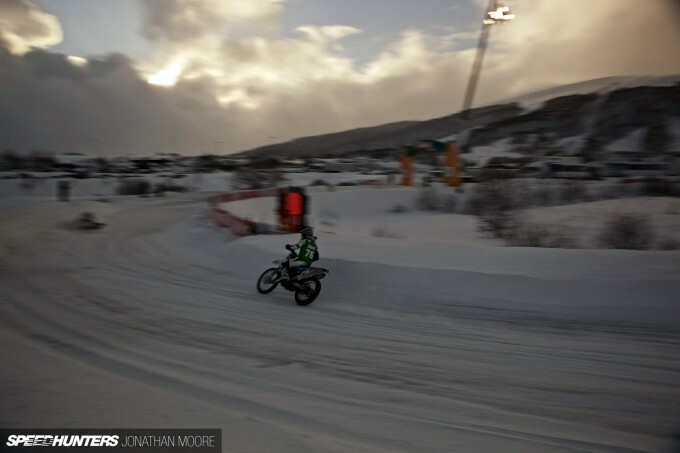 Booting the throttle out of corners, the bikes looked uncontrollable as the riders held on for dear life! Each of the Elite grids had two finals: the opener for the slower five cars, and then the main event with the top eight. 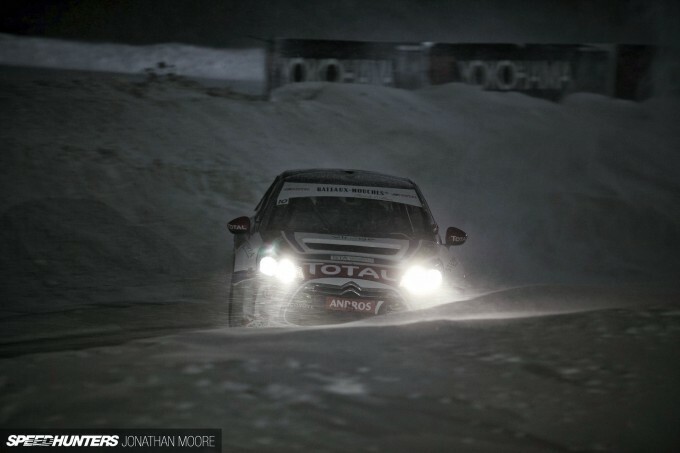 After 12 hours in the snow, I was turning into a snowman, but the rush of the racing soon made my blood flow again. 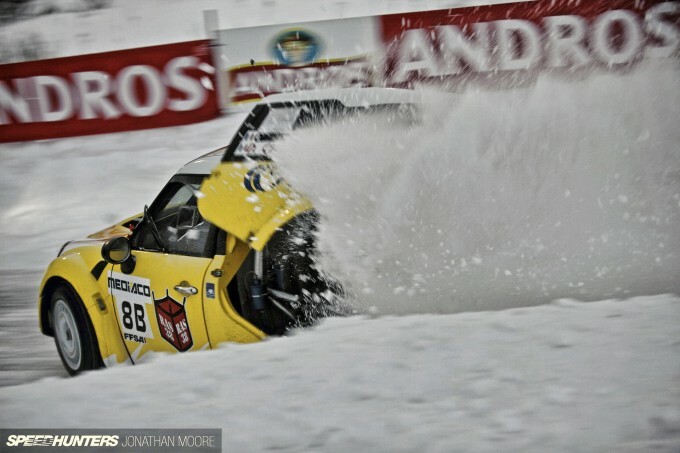 Throttle open, elbows out, snow flying: no wonder they only race once! If five was a squeeze, then the result of eight on track in the Super Finals was predictable. One of the Elite 2 Citroëns was in the wall before even reaching the first corner. Up ahead though, Lionel cruised to an easy victory – effortlessly controlling both the car and the distance to the chasing pack. With nothing to lose, as this was both the final for the night and the season, drivers threw caution to the blustery wind. All round the track great spews of snow were being thrown up as car after car smacked into the snow over the six laps of the race. Five minutes over in a flash! 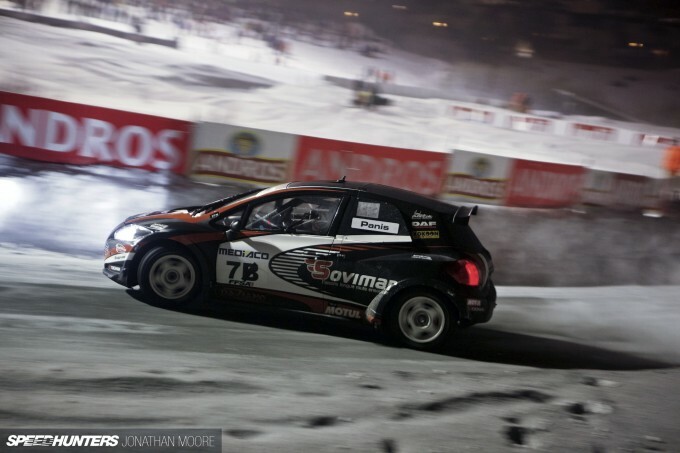 For the Elite 2 Super Final, Olivier did all he could – win, and win convincingly, as like Lionel he banged in a big cushion to the second place car. But behind him Dayraut made that vital position up… One point would be the final deficit, the difference between being champion and second. Still, Olivier and the team could make up for their disappointment with the pride of achieving incredible results in their debut season. 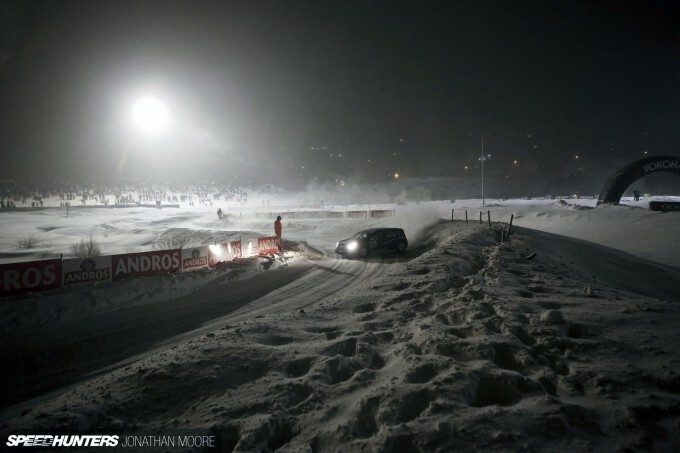 The remoteness of the tracks and difficulty in access is part of the magic of Andros: you have to put in an effort to attend a race like this, never mind drive in it. 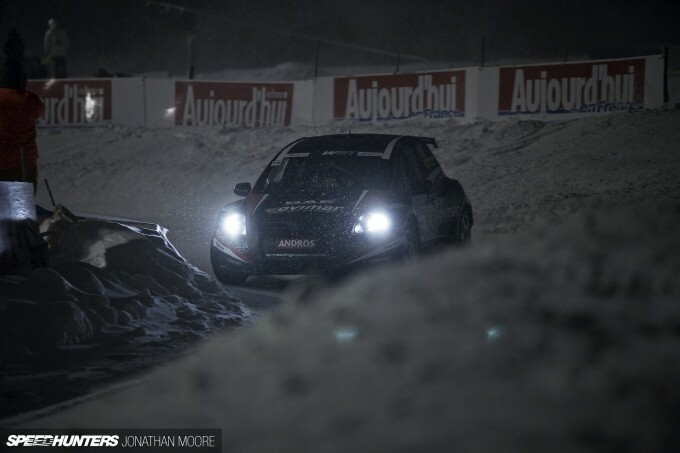 Mainstream French racing drivers queue up to take part, interrupting what should be their winter break and instead getting in a car that steers like it’s broken and doesn’t even have an e-brake. But now I can see why they do it, and I’m sure you can too. Hidden away in the mountains, more French than brie, (although WRT are Belgian of course! 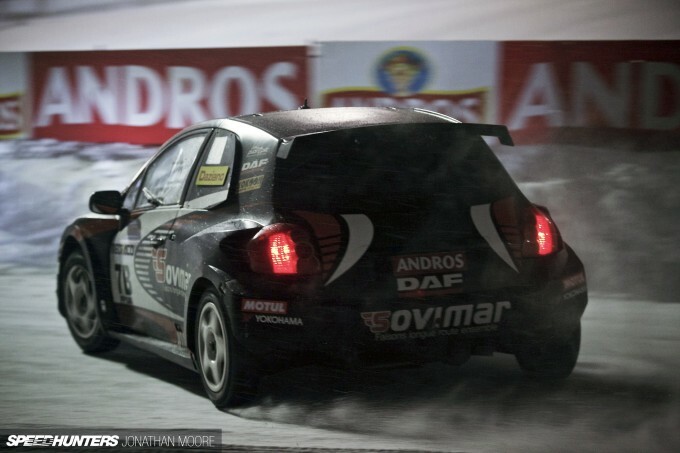 ), Andros is a simply awesome event. 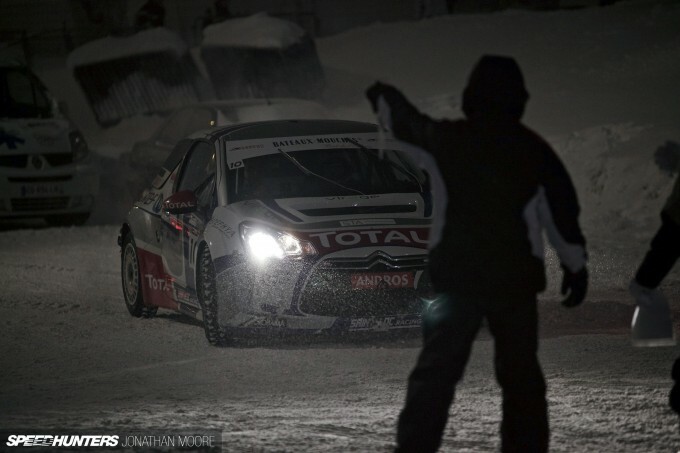 It seems ice and cars do go together rather well after all. 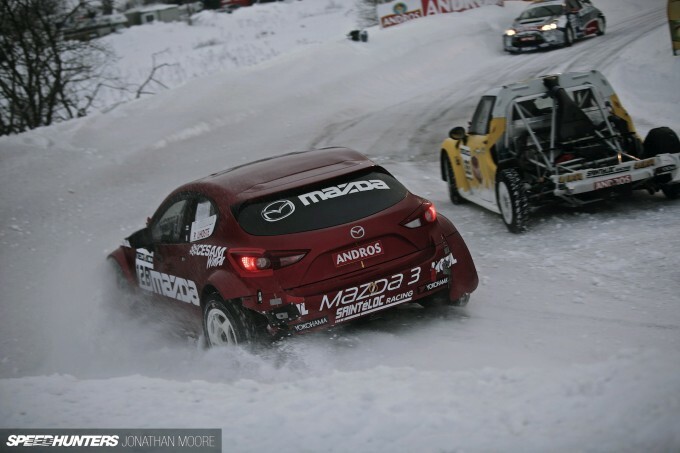 That's totally what the Mazda 2 should look like. I bet the action is amazing, I just think it a shame that these are more representations of cars rather than actually being them considering the space frame fiberglass/carbon covers. WOW this is some pretty epic photography.. I, for one, would like that banged-up Mini. If I am made worthy of this race, of course. 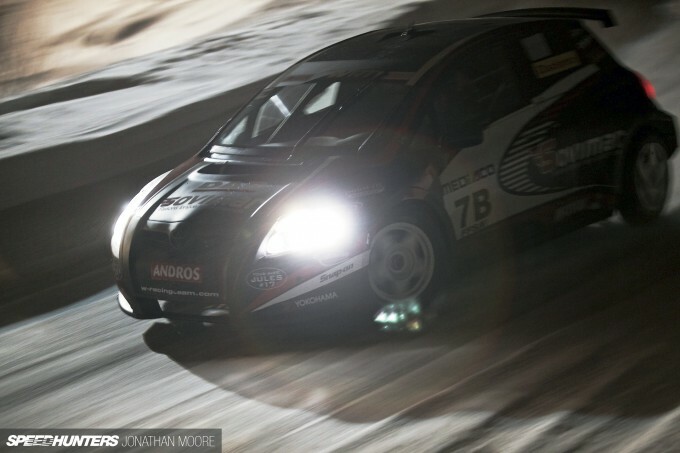 dovvv SpeedHunters has some of the best photographers around! 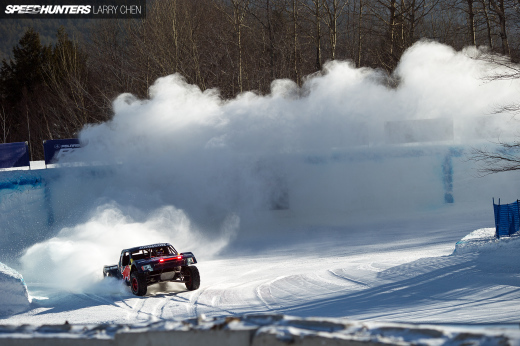 Larry, where are your cover on #gatebil on ice??? greenroadster Side wipers. With the snow that's thrown up and travelling sideways so often, they're obligatory accessories! JakWhite Yep, I get your point: I think it's really down to keeping costs under control. 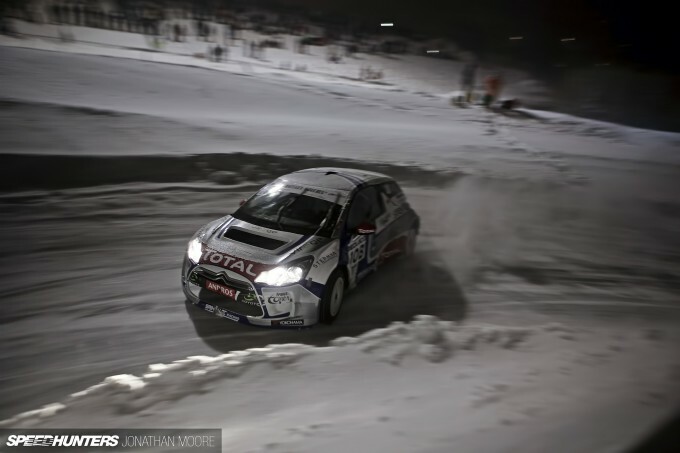 It's a relatively small series, although widely popular in France, so to build cars based on factory originals - or even/especially with WRC shells - would be prohibitively expensive. Nice article. If you’re looking for the best way to sell an old or used car, check out http://caracceptance.com/sell-my-car-novi/ this is the easiest place to sell a used car, and I guarantee they have locations by you too. The process was quick and easy, and I got cash on the spot to easily http://www.caracceptance.com/sell-my-car-novi. 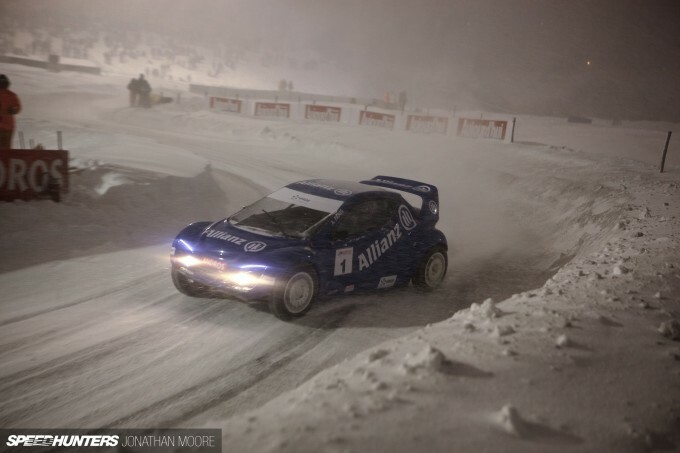 Does anyone remember Opel Tigra Ice Racing from Gran Turismo 2..?